New Delhi: The constant use of headphones and earphones for listening to high decibel music may have become a fad and a style statement for the tech-savvy youngsters but it is also turning into a serious health hazard: it can damage your eardrums and even lead to irreparable noise-induced deafness. The Indian Medical Association (IMA), which has launched a ‘Safe Sound Initiative’, says a lot of youngsters are landing in hospitals with symptoms of tinnitus (humming sound in the ears) because of prolonged use of gadgets like earphones, headphones and mobile phones and they risk thermal and high-frequency hearing loss. Attending night club with music at 110 decibel for one minute, listening to MP3 player at 95 decibel for more than 15 minutes and travelling in a metro with noise at 90 decibel for one hour are all instances of amplified music exposure and even one of these activities in a single day would exceed noise at work regulations for the day, studies show. The issue will come for deliberations at the 2nd National Conference on Safe Sound Initiative, to be conducted by the IMA at Le Meridien hotel on Sunday (March 12). On the conference’s agenda are health, legal and organizational issues as well as the financial aspects of the noise problem. The objective is to sensitize and create awareness in the general public, especially the youth. Padma Shri Dr K K Aggarwal, National President, IMA, will preside over the conference, while Justice Anil R Dave, former justice of the Supreme Court, will be the Chief Guest. Dr. Ajay Lekhi, Organising Chairman; and other IMA luminaries including Dr. C John Panicker, Dr C N Raja, Dr Marthanda Pillai, Dr Vinay Aggarwal, Dr R N Tandon and Dr Ravindra S. Wankhedkar, besides Dr Yeshwant Oke and Ms Sumaira Abdulali of the Awaaz Foundation Mumbai, will share their insights on the issue. Delegates from all the states, including IMA members, ENT surgeons and NGO s working on noise pollution awareness, are to attend. 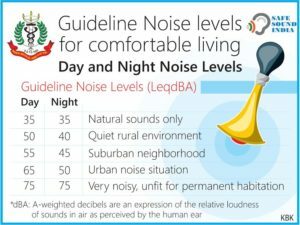 The Safe Sound Initiative is a national project of the IMA, which is working in all states to create awareness about the health problems triggered by noise pollution. 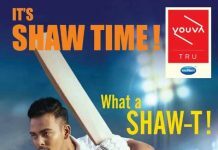 Awaaz Foundation, Mumbai is a partner of IMA in this campaign. 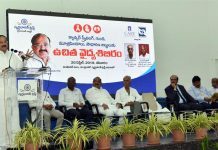 Dr. C John Panicker, National Coordinator, IMA (Safe Sound Initiative), points out that noise induced hearing loss is a lifestyle disease and it is the number one reason for preventable permanent deafness. 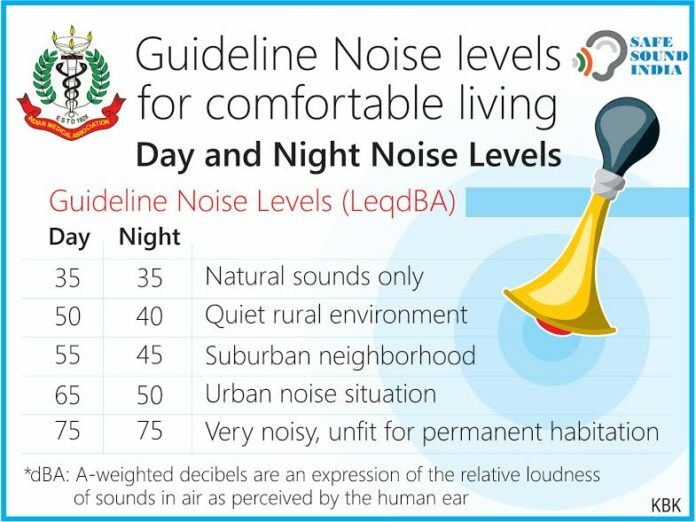 Car honking, continuous use of mobile phones, and home noise (use of fan at high, noisy speeds, watching TV and listening to radio at high volume and using high noise home appliances) can all lead to hearing impairment. The IMA, which organized the first such national conference in Kolkata last year, has issued series of Do’s and Don’ts to minimize create awareness about the issue. Use of personal sound protection devices (ear plugs and muffler when exposed to sound above 80 decibel), avoiding continuous use of mobile phones (use speaker phones whenever possible), using soundless crackers, breaking for a few minutes while using earphones/headphones, avoiding honking and discarding noise-churning home appliances — are among the prescriptive measures suggested by the IMA to combat noise pollution. Also, there are many apps available which can be downloaded in mobile phones to measure the volume of sound. Prof. Mohan Kameswaran, ENT surgeon from Chennai, says India is the noisiest nation in the world and Indians cannot celebrate, worship or even mourn without making very loud noise. Globally, 1.3 million people are affected by noise pollution and 10% of the world’s population is exposed to sound pressure levels that could potential cause noise induced hearing loss. Noise pollution, according to a 2014 report, causes 43,000 hospital admissions in Europe per year. A German study ranks Delhi as the fourth noisiest city in the world after Guangzhou (China), Paris and Cairo. “Basically, we are now reaching a stage where we are looking at not just prevention but may also be looking in the near future in intervention and restoration of hearing,” he notes.